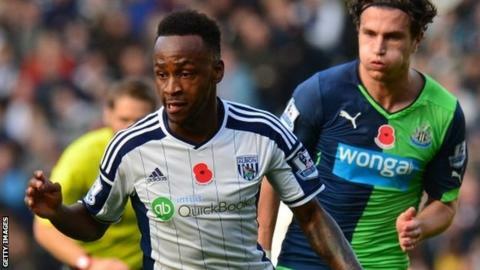 West Brom have begun talks with Saido Berahino in a bid to extend the striker's current deal beyond 2017. The 21-year-old, who has scored eight goals this season, suggested he might have to move away in order to play in the Champions League and World Cup. "We have opened preliminary talks with Saido's representatives," chairman Jeremy Peace told the club website. The former Baggies academy player was called up to the England squad for the first time last week. "This reflects proudly on our club and the efforts of all the staff who have played such a key role in Saido's progress since he arrived here as an 11-year-old," Peace said. "However, it seems to have also generated unwarranted and excitable speculation about his future - which I wish to stress remains very firmly aligned to this football club."